Welcome to our Conference Table Collection. 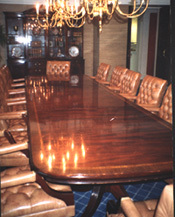 Along with our Banquet tables our Conference table are primarily made using solid Mahogany. Our tables can be custom made to fit any size room you currently have. 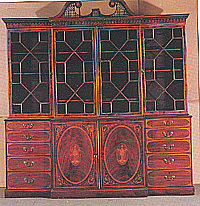 Most of our tables are produced in the Queen Anne, Chippendale, and Sheraton period styles. Executives at venerable corporations from Coca-Cola to Delta Airlines including Space Pioneers who travel in the U.S. Space Shuttle make decisions at custom made tables built by Scholte Craftsmen. Our tables are made and finished to blend beautifully with other fine furniture and chairs which we also have available. 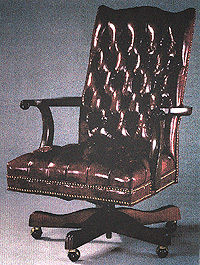 Every item reflects our goal, which is to provide our customers with only the very best quality furnishings. Quality is our company’s first and foremost business philosophy. Please browse thru each section and review the various items we have to offer. However, remember each piece that is made is distinctive and can be customized to your specific requirements.